End Your Struggle with Weight. Common sense tells us that in order to lose weight we must eat less and exercise more, but somehow we get stalled. We start on a weight-loss program with good intentions but cannot stay on track. Neither the countless fad diets nor the annual spending of $50 billion on weight loss products help us feel better or lose weight. Too many of us are in a cycle of shame and guilt. We spend countless hours worrying about what we ate or if we exercised enough and blaming ourselves for actions that we can't undo. We are stuck in the past and unable to live in the present - the moment in which we do have the power to make changes in our lives. Offering practical tools including personalized goal setting, a detailed nutrition guide, and a mindful living plan, the authors help us to uncover the roots of our habits and then guide us as we transform our actions. 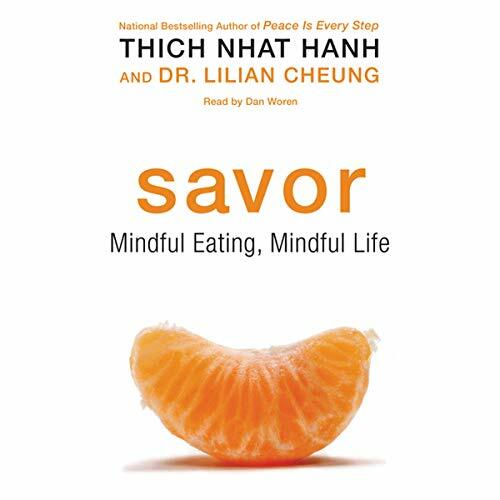 Savor teaches us how to easily adopt the practice of mindfulness and integrate it into eating, exercise, and all facets of our daily life so that being conscious and present becomes a core part of our being. It is the awareness of the present moment, the realization of why we do what we do, that enables us to stop feeling bad and start changing our behavior. Savor not only helps us achieve the healthy weight and well-being we seek, it also brings to the surface the rich abundance of life available to us in every moment.